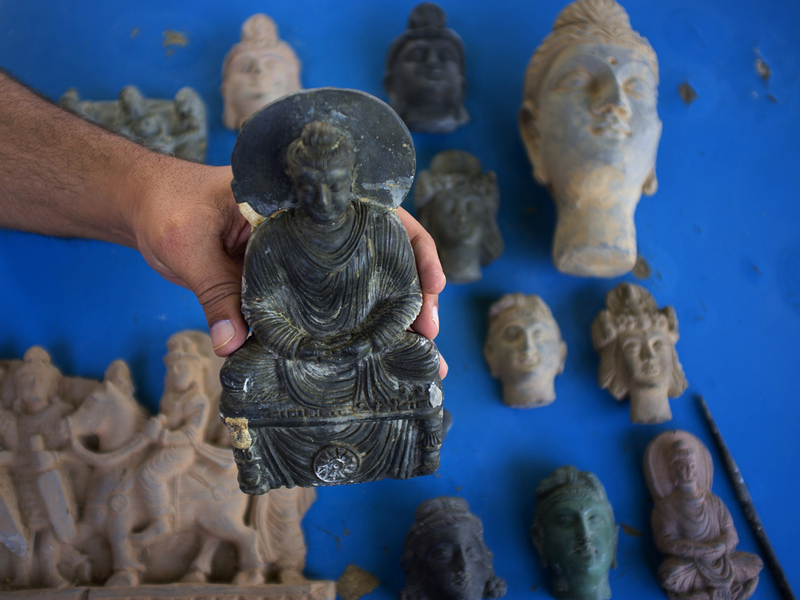 ISLAMABAD Lacking the necessary cash and manpower, Pakistan is struggling to stem the flow of millions of dollars in ancient Buddhist artifacts that looters dig up in the country's northwest and smuggle to collectors around the world. The black market trade in smuggled antiquities is a global problem that some experts estimate is worth billions of dollars per year. The main targets are poor countries like Pakistan that possess a rich cultural heritage but don't have the resources to protect it. The illicit excavations rob Pakistan of an important potential source of tourism revenue, as valuable icons are spirited out of the country, and destroy any chance for archaeologists to document the history of the sites. "We are facing a serious problem because Pakistan is a vast country, and we have very meager resources," said Fazal Dad Kakar, head of the government's department of archaeology and museums. "We have no manpower to watch the hundreds of Buddhist sites and monasteries in the country, most of which are located in isolated valleys." Many of the sites are in the Swat Valley, a verdant, mountainous area in the northwest that was once part of Gandhara, an important Buddhist kingdom that stretched across modern-day Pakistan and Afghanistan more than 1,000 years ago. Police seized a large container filled with nearly 400 artifacts in the southern port city of Karachi in July that were being trucked north to be smuggled out of the country. About 40 percent were found to be genuine, including nearly 100 Buddhist sculptures up to 1,800-years-old worth millions of dollars, said Qasim Ali Qasim, director of archaeology and museums in southern Sindh province. There were effectively no restrictions on whisking Buddhist relics out of Pakistan's northwest in the first few decades after the country achieved independence from Britain in 1947, said Malik Naveed, a former police chief of Khyber Pakhtunkhwa province, where the Swat Valley is located. That changed in 1975 when the government passed a set of laws criminalizing the practice. But Kakar, the federal archaeology chief, said the laws are difficult to enforce given a lack of funds, and people who are caught rarely receive punishments severe enough to act as much of a deterrent. Police arrested several people connected to the seizure in Karachi in July, but they have yet to be formally charged. Two men who were arrested last October for excavating a statue of Buddha from a site in Swat were only fined about $50 each, far less than the maximum punishment of a year in prison and a fine of more than $800 they could have received, said Syed Naeen, a public prosecutor in the area. A Manhattan art dealer, Subhash Kapoor, is under arrest in neighboring India for allegedly smuggling millions of dollars in antiquities out of India, Pakistan and Afghanistan that he sold to museums and private collectors from his gallery in New York and online, according to police investigators involved with the case. Rather than dig up Buddhist relics, some Pakistanis have focused on making replicas, such as the ones seized in Karachi, that they often try to pass off as the real thing  although this practice is also illegal in the country. Many operate covertly around the ancient Buddhist site of Taxila, a short drive from the capital, Islamabad. "I learned the practice from my fellow villagers in my childhood and can fake anything using cement, small stones, some colors and chemicals," said Salahud Deen, who works out of his home in a village near Taxila. The 30-year-old high school dropout was contacted by The Associated Press through the owner of a tea shop in the area and showed off a sample of his wares, including a small statue of the Buddha's head. He said he recently received an order from a man in Sri Lanka to make a 3-foot tall "fasting Buddha" statue and expected to make a little more than $200 in the process. Locals who deal in real Buddhist artifacts they have stolen from sites in the northwest likely make much more money, but it's almost nothing compared to what people higher up the food chain earn. Looters receive on average less than 1 percent of the final sale price of an item, while middlemen and dealers get the other 99 percent, according to the former head of the U.N. Interregional Crime and Justice Research Institute, Sandro Calvani. Kakar, the federal archaeology chief, tried to stop Christie's auction house in New York from selling a "fasting Buddha" from the 3rd or 4th century last year as well as dozens of other Buddhist relics he claimed were smuggled out of Pakistan illegally. Christie's went ahead and sold the Buddha for nearly $4.5 million and has asked Pakistan to provide proof of its claims, the auction house said. Kakar was more successful with two shipments of Buddhist artifacts from Dubai and Tokyo that were seized by U.S. customs authorities in 2005, he said. He was able to prove the sculptures came from Pakistan by analyzing the age and composition of the stone, and the U.S. returned them, said Kakar. Neil Brodie, an expert on the illicit trade in antiquities at the University of Glasgow, said it was critical for authorities to put pressure on private collectors and museums whose demand for ancient relics is fueling the black market. Some museums, particularly in Italy and Britain, have become more diligent about avoiding antiquities with questionable histories, but those in the U.S. have much more work to do, he said. "You are losing the archaeological record on the ground by the destruction that is entailed by digging these relics out," said Brodie.